Stéphanie was born in Italy to a French-Canadian father and an American mother. She studied litterature, worked in theatre, completed a degree in education and taught as an elementary school teacher before finding her true vocation as a storyteller in 1994. Since then, Stéphanie has performed professionally in hundreds of schools, concert halls, festivals and libraries in Québec, Ontario and Europe. A fluently bilingual performer and a registered member of the Artists in Schools program, Stéphanie has toured Ontario during Canadian Childrens' Book Week and has been a featured speaker and workshop leader at many conferences. Over the years, Stéphanie has built a vast repertoire of stories for young people. She has also developed a unique storytelling workshop which she presents in schools as part of Culture in Schools and the Supporting Montréal Schools programs. 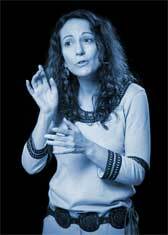 Stéphanie brings old stories from the oral tradition back to life in a lyrical and poetic voice touched with humour. She is particularly interested in stories about women, which she tells in a lively, expressive and compelling style all her own.